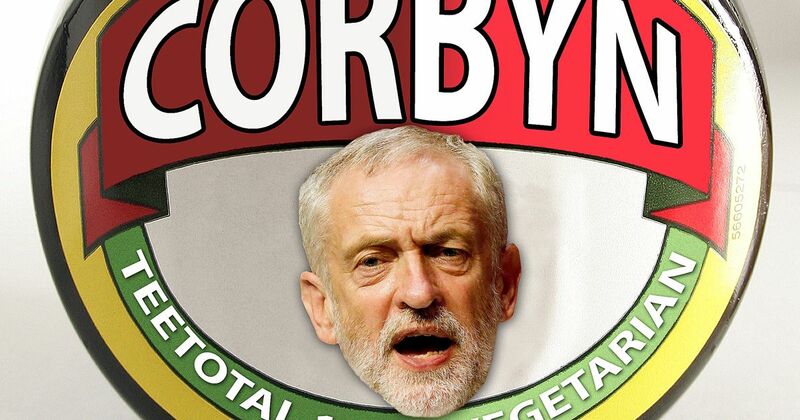 ‘Bearded vegetarian socialist’: Jeremy Corbyn and the authenticity wars. Following Jeremy Corbyn’s meteoric (although, in another sense, very slow) rise to become leader of the Labour party, there has been much debate over his ‘authenticity’. It’s unsurprising that Corbyn has been praised for being a more authentic politician. Corbyn appears to be an ‘ordinary outsider’, as whilst he has been an MP for more than 30 years he has never previously held a cabinet or shadow cabinet position and has been the most rebellious Labour MP. His political persona is a stark contrast to that of slick old Etonian David Cameron. While van Zoonen argues that each type of political performance (she proposes a typology with four categories) has its flaws, she also suggests that the success of these performances depends on the political context, with people preferring political personalities that contrast with their opponents and predecessors. Corbyn also does well on another suggested measure of authenticity: consistency. He stood to be Labour leader on a platform based on values and policies he has campaigned for for decades. But authenticity is a battleground: whilst those who support Corbyn praise his consistency and contrasting style to Cameron, his opponents have sought to find inconsistencies not only within Corbyn’s long public political history, but also perceived inconsistencies between Corbyn’s persona and what a political leader ‘should’ be like. In the process, they betray their perceptions of what sort of person is qualified for the top job. We’ve already seen several of Corbyn’s political opinions used to deem him ‘unsuitable’ for the role of prime minister or even leader of the opposition, such as his opposition to trident and his belief that the UK should be a republic. But personal traits have (unsurprisingly) also been used to imply that Corbyn is not leadership material, such as his age, his ‘scruffy’ appearance, and the fact that he rarely drinks alcohol and doesn’t eat meat. A Huffington Post blog joked that to endear himself to the right wing press Corbyn should, amongst other behavioural changes, eat some meat. The right wing press have certainly noticed Corbyn’s eating habits; his vegetarianism has been mentioned frequently in negative pieces about the new Labour leader’s personality, history, and beliefs. Fox News delighted in calling Corbyn a ‘bearded vegetarian socialist’, but references to his vegetarianism are usually more subtly inserted into long lists of personal traits that mark Corbyn as too weird to be prime minister. But why is being a vegetarian used, alongside other traits and opinions, to portray Corbyn as ‘other’? Why is vegetarianism perceived as incompatible with leadership? To me, this is indicative of old-fashioned ideas that still pervade the ideal of what a leader ‘should’ be like. His vegetarianism is deemed relevant because it adds to the image of Corbyn as someone who challenges the status quo and therefore, to his opponents, someone who is dangerous. It is often mentioned alongside Corbyn’s pacifism, his long-standing opposition to nuclear weapons, and his supposed sympathy for terrorist organisations. Vegetarians, clearly, cannot be trusted. Vegetarianism is also considered by some to be ‘unbritish’. It doesn’t help that while our national identity is vague, our ‘national dishes’ are meaty. How can you be British if you don’t eat roast dinners, fish and chips, or chicken tikka masala? A Telegraph writer living in Henley-on-Thames suggested that Russell Brand, also vegetarian, would struggle to move there because unlike (multicultural) Hackney, in (pale and stale) Henley ‘it is nigh-on a crime not to serve meat and two veg for dinner’. I also think, bear with me, that to imply that vegetarianism is incompatible with leadership is to betray a sexist perception of what the ideal leader is like. The idea that leaders should be masculine includes, as media repeatedly noting Corbyn’s deviation demonstrates, that they should eat meat. 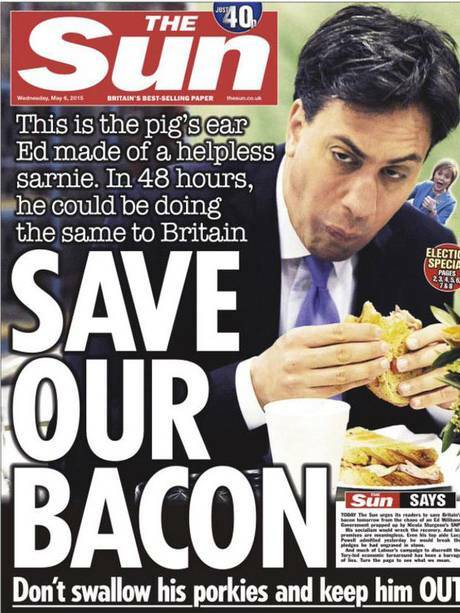 British leaders ‘should’ eat meat to demonstrate that they are both masculine enough and British enough. When was the last time you ate a Cornish pasty? Can you eat a bacon sandwich properly? How are your barbeque management skills? Ed Miliband was ridiculed for not being able to eat a bacon sandwich ‘properly’, as if he’d failed a manliness test (what’s more interesting than him declaring ‘hell yes I’m tough enough’ during the campaign is the fact that Paxman asked him whether he was in the first place). Corbyn’s vegetarianism is used as yet another way to paint him as ‘other’, not an authentic potential Prime Minister when the role of Prime Minister is still perceived as something for overtly patriotic, stereotypically masculine men. Of course, this ridiculing of Corbyn’s vegetarianism, as well as other personal traits, may also stem from fear; fear that Corbyn wants to enact policies that threaten the lifestyles of the privileged. In this case, were Corbyn to actually become Prime Minister he could well be the first to acknowledge that we can’t solve the climate crisis unless we eat less meat. It will be interesting to see whether the Conservative-supporting press continue to imply that Corbyn, who became a vegetarian aged 20 after seeing cruelty on a pig farm, has a strange relationship with animals, considering the rumours about what David Cameron did at a similar age. van Zoonen, L., 2004. Entertaining the Citizen. See Sarah Banet-Weiser (2012). AuthenticTM: The Politics of Ambivalence in a Brand Culture. And Alice Marwick and danah boyd (2011). To See and Be Seen: Celebrity Practice on Twitter. Convergence 17 (2). Does reaction to Charlotte Church’s ‘prosecco socialism’ show that authenticity is out of reach for celebrity activists? It’s fair to say that Charlotte Church was unhappy with the result of the UK’s latest general election. 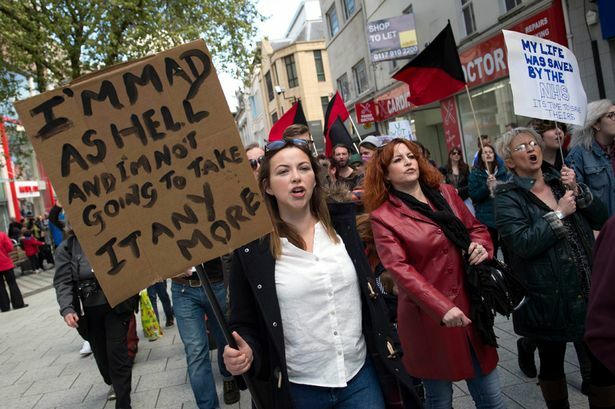 After the Conservative party unexpectedly won an overall majority, Church not only reiterated her dislike for the Tories on Twitter, but attended an anti-austerity protest in Cardiff. 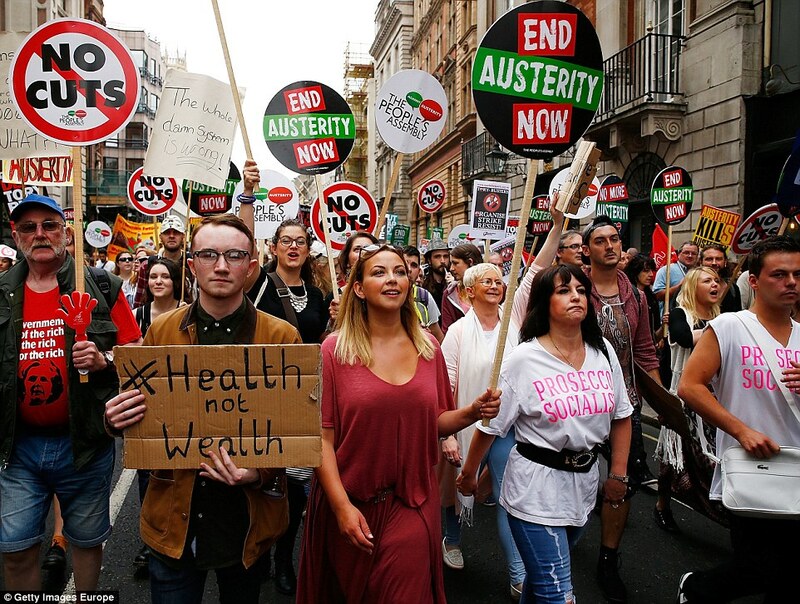 This attracted a lot of attention, and by June 20th Church was not only participating in The People’s Assembly anti-austerity protest in London, but giving a speech to the thousands of protestors in parliament square. Church was not the only celebrity to address the crowd, but her speech did attract the most attention. This may be partly because Russell Brand did not want to give interviews that day, but may also be because Brand is now an established and expected presence at such events, whilst Church is a fresher face. 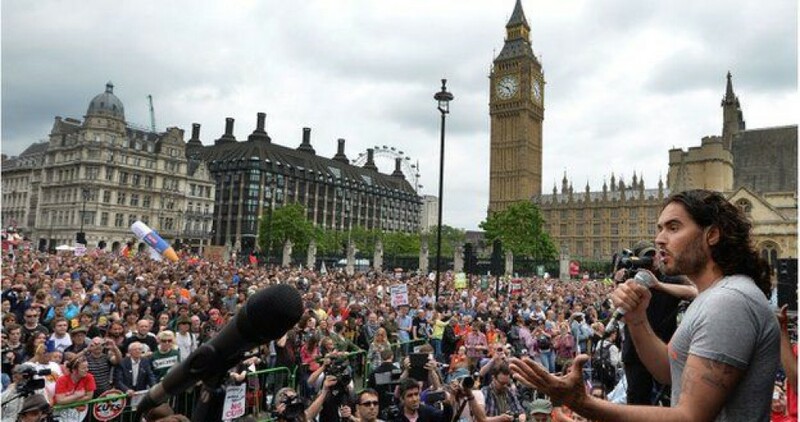 Her speech attracted much online coverage, and she was interviewed for BBC, ITV, Channel 4 and SKY News. Church would have known that her role in the protest would attract criticism; before the event had even finished she had discussed accusations of hypocrisy, and the difficulties artists face in talking about politics, with Channel 4 News. Church’s mum even wore a T-Shirt stating ‘prosecco socialist’, referencing her comeback that she was ‘more of a prosecco girl’ to the leader of the Welsh Conservatives who dismissed her as a champagne socialist. Church had previously been criticised for not ‘voluntarily’ paying a higher rate of tax, after she stated that she would be happy to pay 70% tax in order to contribute to properly funded public services and an end to austerity. Church’s speech, however, brought a new wave of criticism, much of this using misogynistic language, and new accusations of hypocrisy. Looking at celebrity involvement in progressive campaigns, a clear pattern emerges. Evidence of alleged hypocrisy is quickly found and (re)posted by right-wing bloggers or journalists, and this is then used by others to criticise the celebrity’s political statements and suggest that they should not be participating in political movements. Following Church’s statement that she would pay 70% tax to support public services, a Conservative councillor uploaded a video to YouTube of Church appearing on Have I Got News For You 12 years ago (aged just 17), complaining that she pays too much tax. Guido Fawkes then embedded this in a post accusing Church of being on a ‘mission to be reborn as a poundshop Russell Brand’. Following the protest Fawkes accused Church of further hypocrisy, publishing a quote from the website of the accountancy firm used by her companies which stated that ‘lowering and deferring tax is, of course, a key aim’. This new allegation was used by many of Church’s Twitter critics. This is now a familiar pattern; the speed with which Russell Brand (following a housing protest) was declared a hypocrite for the tax affairs of his landlord, or Martin Freeman a champagne socialist because of his son’s private education (following his Labour party political broadcast) is impressive. But Church was faced with not only trying to refute these accusations of hypocrisy, but also calling out the sexism of many of her critics. All of the narrow minded trolls, I'm bored now. I hope you can try and work out the Stockholm Syndrome stuff you have going on. Can a celebrity be an ‘authentic’ activist? These accusations of hypocrisy are founded on a perceived inconsistency between the person’s political statements, or the political aims of any movements, groups or parties they are associated with, and other aspects of their life. This fits with recent academic debates over what authenticity is, which conclude that authenticity is a performance. Rather than about ‘being yourself’, to be perceived authentic a person must present themselves consistently across the different areas of their life, and the different platforms they use to communicate. Clearly, this perceived authenticity is difficult to achieve, but there are three key reasons it may be even more difficult, perhaps even impossible, for a celebrity who becomes involved in left-wing political activism. Cries of ‘hypocrite’ often come from the tension between the celebrity’s elevated wealth and status and their desire to speak on behalf of those who do not have these privileges, but there are other barriers to authenticity. If someone has been famous for a number of years, it is almost inevitable that some aspect of their mediated life can be found and used as evidence of inconsistency, and therefore inauthenticity. Charlotte Church became known as a singer at the age of 11, we should not be surprised that her opinions have changed over the past 18 years. The celebrity/activist is also likely to have their fingers in several pies, which creates more opportunities for inconsistency. Those who wish to ‘expose’ the celebrity as inauthentic can search for tensions between the celebrity’s commercial activities and their political statements. Even in cases where these allegations of hypocrisy are tenuous, such as Russell Brand being held accountable for the actions of his landlord, the celebrity is then drawn into time-consuming arguments with critics. If consistency is the key to being perceived as authentic, and authenticity is the key to being taken seriously, the celebrity-activist is likely to find that their fame opens doors, but that there is a crowd of critics armed with Google and Twitter waiting on the other side. Church’s case demonstrates that for women, their authenticity as an activist will often be debated in misogynistic terms. Of course a celebrity’s political actions or statements, and their intentions, should not go unscrutinised. However, these petty disputes over minor inconsistencies in a celebrity’s mediated life hold the celebrity to a standard of ‘authenticity’ which is unattainable, and distract from the political issues up for debate in the process. Alice Marwick and danah boyd (2011). To See and Be Seen: Celebrity Practice on Twitter. Convergence 17 (2). Sarah Thomas (2014) ‘Celebrity in the “Twitterverse”: history, authenticity and the multiplicity of stardom. Situating the “newness” of Twitter’, Celebrity Studies 5 (3).